I use 2 cups of COOKED deboned, defatted, deskinned chicken, cut up into 1″ cubes. It’s easiest to just buy boneless, skinless, chicken breasts. To make prep-time go faster, you can cook the chicken and cube it the night before. garlic powder, onion powder, salt (may omit if using full-sodium soups), pepper, italian seasoning–all to taste. Once your chicken is cooked and cubed, in a medium bowl, mix it in with all the soups (don’t add water to the condensed soups! ), all the veggies, the chicken broth, and the seasonings you prefer. Put this is a 9×13 or 9×15 pan. Preheat your oven to 425. 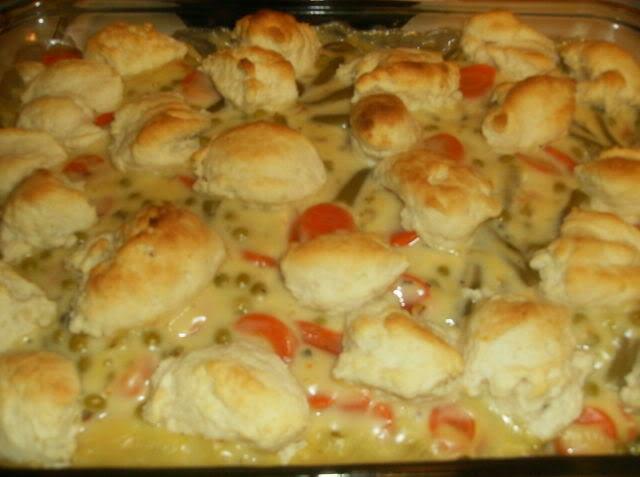 Mix up the sour cream biscuits in a small bowl, according to the directions. 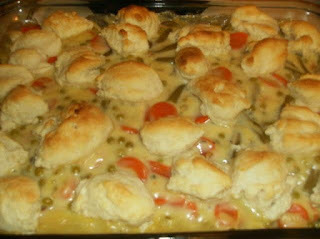 Then, using a tablespoon, just dollop the biscuit dough on top of the chicken and veggie mixture. Bake at 425 for 15-20 minutes. It’s really quite simple! Sift flour, measure, and sift again with baking powder and salt; blend in butter. Add sour cream; knead several times on a lightly floured surface. Pat dough out, cut into diamonds or rounds and place over chicken or drop dough onto chicken pot pie by tablespoon.